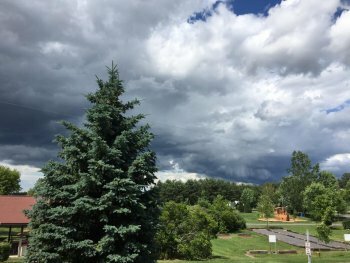 Started by Harold & Sharon Dadson in 1996, Junius Ponds Cabins and Campground has evolved into a great place to stay whether you're looking to pass through or stay with us awhile. Since opening the campground has expanded by over 200 sites including seasonal, long term, weekend, tent sites and cabins. We love to have a good time with good friends, young and old, new and familiar. Pets are always welcome to our campground because they are apart of the family too! Our friendly office staff are always here and willing to help with any questions, comments or concerns. We are located within minutes of many great activities that any of our helpful staff would be happy to find or recommend to you! Proud owner Eric Dadson goes above and beyond to make sure everyone of his guests are satisfied. Make this your new summer stop for a great experience! Junius Ponds Cabins and Campground is located near Phelps, New York, in the northwest part of the Finger Lakes region. 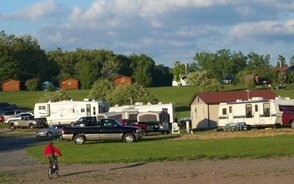 The campground is about a mile from I-90, but you'll feel as though you've stepped into a quiet countryside. Junius Ponds Cabins and Campground is much more than just a place to park your RV, pitch your tent, or rent a cabin. Whether you would like to relax at your site, participate in one of our many weekend activities or just stroll around the park there is always plenty to do! Activities and amenities are available for everyone from kids to adults. Enjoy a refreshing swim after a day of camping activities or exploring the area! The kids will have hours of fun on the ever so popular Monster Truck, Train or Pirate Ship Playgrounds. Challenge your friends or family to complimentary games such as Pickleball, air hockey and more! With a variety of activities there is always something happening so your kids can never say "I'm bored." ©2019 Junius Ponds Cabins and Campground. All Rights Reserved. | Website by Corporate Communications, Inc.